Dr. Darrell Swolensky presents the PL5 cold laser to the residents of Henderson andLas Vegas, Nevada as an additional means of reducing pain, increasing healing and faster recovery. This page is divided into two parts. Part I is something that can be understood by many, if not all people. Part II is more technical and is there for those who want a deeper understanding of the cold laser. Its positive effects are many and well-researched. For example, research demonstrates that the laser effects the mitochondria (energy producing part of the cell) thereby enhancing the production and synthesis of ATP (energy production). It also optimizes oxygenation and phagocytosis (cleaning up debris and waste), increases the tensile strength of healed tissue, reduces swelling, increases blood flow, increases lymphatic activity, reduces inflammation, increases cellular metabolism and repair, promotes collagen formation, and much more. But how does it work? If you are like most people when you first see a demonstration of the laser you might find yourself thinking, “How is this possible? All you are doing is shining a blinking red light on people and they are getting quick and often amazing results.” To answer that question properly you would have to investigate the fascinating interface between biology and quantum mechanics – a huge undertaking, by the way, and one that I am only going to sketch in the broadest of strokes here. Before I had ever heard of low level laser therapy, I had read Mae-Wan Ho’s superb book, The Rainbow and the Worm: The Physics of Organisms.4 Her articulation of the theory that living bodies are liquid crystals organized around a central vertical axis was a revelation to me. Amazingly, Ho has also found a way to take pictures of the living crystalline continuum. I was never able to find a satisfactory word for that unified self-sensing coherent whole that I was reluctantly calling the one-substance until I read Ho’s book and realized that what I was feeling was the inherent movement of a self-correcting liquid crystal always striving to integrate itself around its midline. This midline is not the line of gravity, but a manifestation of the core midline function – the fundamental organizing principle of the body discovered by William Sutherland, Randolph Stone, and cultivated in many forms of oriental meditation.5 The line of gravity is an abstraction imposed on the body from the outside whereas the core midline is a dimension of the body itself. What Dr. Rolf called the core of the body may well have been this primordial midline. She may have been attracted to what she called the line of gravity as a less than perfect surrogate for this midline because it may have seemed more “objective” and less “metaphysical,” and hence, more acceptable to the public. In any case, after I discovered the laser, I realized that Ho’s book contained the science needed to understand how the laser works. Then I read James Oschman’s two wonderful books and discovered a great deal of insight into the scientific basis of energy medicine and more of the science necessary to understand how the laser works.6 Many Rolfers are familiar with Oschman’s work, especially those who were fortunate to have him as a teacher when he taught for the Rolf Institute. Since Oschman’s investigations into what he calls the living matrix were originally inspired by his experience of Rolfing, his books are written in the kind of detail that makes immediate sense to Rolfers and other therapists. Both Ho and Oschman also make interesting and suggestive remarks about the nature of consciousness. Most scientific investigations into the nature of consciousness overlook the fact that scientific third person accounts of consciousness do not capture critical features of consciousness that are rendered more appropriately in first person accounts. Accordingly, I would add to their discussion a more detailed elaboration of why the distinction between a first person and third person ontology is so crucial to any investigation into the nature consciousness. A related and very critical point that should also figure into our understanding of consciousness is Merleau-Ponty’s7 often overlooked concept of corporeal reflexivity (the capacity for self-sensing). Self-sensing is not a capacity unique to those organisms with a nervous system, but it is intrinsic to all life. Since what we recognize in ourselves as consciousness is an evolutionary elaboration of the self-sensing common to all living creatures, consciousness cannot be fully comprehended by investigating the brain and nervous system alone. It must also include what Oschman calls the living matrix and perineural system and what Ho calls the living crystalline continuum. It is also absolutely crucial that we recognize that self-sensing cannot be comprehended in the third person ontology of mechanistic science. Since I have dealt with these issues elsewhere,8 I won’t go into any more detail here. In any case, no matter what your philosophical predilections are, these three books should be must reading for every Rolfer regardless of whether they are interested in laser therapy or not. To understand how the laser entrains the body back to normal function you have to appreciate that the liquid crystalline nature of the body is a miraculously orchestrated form of coherent energy that is organized around a midline. The idea that the body produces coherent laser-like oscillations was first predicted by Herbert Fröhlich in the late 1960’s. His predictions were later confirmed.10 The discovery that the liquid crystalline nature of the body produces coherent laser-like energy accounts for how all aspects of any living creature can communicate with itself almost at the speed of light without or independently of a nervous system. In quantum theory, coherence is a complex and multilayered technical concept that has specialized meaning beyond ordinary usage. To understand it completely we would have to explore the paradoxical view that light is simultaneously wave-like and particle-like. Unfortunately, an articulation of the wave-particle duality is well beyond the scope of this article. In order to keep the discussion simple let’s begin by looking at the nature of the laser. To say that laser light is coherent means that it is a beam of photons that have the same frequency phase and direction. Incoherent light is the kind of diffuse, scattered light that comes from the sun or a light bulb. Incoherent light becomes less intense as it travels further from its source whereas coherent light can travel great distances without spreading out and losing its intensity. Especially with respect to living creatures, coherence always means wholeness. Coherent energy is stored energy that can be mobilized to do work whereas incoherent energy spreads out in all directions and cancels itself out. Biological organization is coherent: every aspect of the whole, from the micro to macro levels, functions autonomously, but at the same time every level is coupled together, in communication with, and perfectly in step with every other level. Ho warns us not to think of coherence as uniformity where every level is doing the same thing. Rather she suggests we imagine biological organization as a huge jazz superorchestra where new parts are continuously and spontaneously being made up and improvised, where each individual player enjoys complete freedom of expression, but where everybody remains perfectly in step and in tune with the whole.11 In biological organization the individual players, whether an individual organ, cell, tissue type, or system, have individual frequencies that all combine to create a harmonious collective frequency that is an integrated, unified whole. If these frequencies are disturbed and the body is incapable of entraining them back to normal, then disorder, dysfunction, and disease occur. If I may be permitted a slight digression at this point, I want to revisit our concepts of integration and the line of gravity in light of the above attenuated discussion of coherence. I have been saying for years that we need to investigate biology for a more complete and useful understanding of the nature of integration. As has been pointed out on many occasions, understanding integration according to how well a body approximates the line of gravity falsely presupposes that the body is equally dense throughout like a stack of blocks. Thus, it is not really possible to align the body along the line of gravity. Furthermore, the block model forces you to see the body as a nonliving object that is being passively acted upon by gravity. This way of thinking completely occludes the spectacular nature of biological organization and integration and entirely misses the fact that living organisms are self-sensing, self-organizing, and always orthotropically responding to gravity. They are never merely passively acted upon by gravity in the way a stack of blocks is. This way of thinking also leads practitioners to attempt to force every body into the same structural mold and miss how each structure is struggling to realize its own unique morphological imperative. The line of gravity may be a useful way to begin understanding how our bodies relate to gravity, but in the end it is a beguiling, but rather poor surrogate for the primordial core organizing midline. Paying attention to how a morphological type appropriates gravity by always striving to organize itself around its midline is structurally and functionally more potent than making it measure up to an external norm such as the line of gravity. The primordial core midline function is closer to the true line of integration because is it an intimate and perceivable part of the very organization of the body itself. Unlike the line of gravity, which has no intrinsic perceivable organizing referent in the body and functions like an external abstract standard to which the body is supposed to conform, the core midline is inherent to the body and, as a result, a reality you can get your hands on. Since the primordial midline is at the very heart of how the body is organized in gravity, it is the very substance of Rolfing itself – essential to the vision of Rolfing and to what Rolfers should always be attempting to modify and kindle. Since I have criticized this way of thinking in some detail and provided alternative ways of understanding integration in other articles, I don’t want to go into much more detail in this one.13 But notice that here in the interface between quantum theory and biology we find a way of understanding biological organization and integration that is far richer and more productive than viewing the body according to how well it measures up to the line of gravity and that supports some of the new directions we are taking with respect to the idea of integration. That being said, let’s return to the question of how the laser works. Given the above discussion of coherence, we can state the answer simply: the laser restores balance, harmony, and order by entraining the out-of-step frequencies back to their proper oscillations. The laser is actually integrative in its effects. You simply program in the appropriate frequencies, laser the affected areas, and the body is entrained back to coherence, and hence, normal functioning. Let’s look at the workings of the laser in a little more detail. Research demonstrates that a wavelength of 633-635 nanometers is the frequency of a healthy cell and optimal for healing (one nanometer is one billionth of a meter). The Erchonia laser is a precision instrument with high quality diodes that delivers a line-generated beam at a constant wavelength of 635 nanometers and at a power level of less than one mili-watt. Hot lasers which are used to cut or cauterize tissue have an output of one watt or above. Cold lasers have no thermal effect on tissue. The ability of the Erchonia laser to maintain a constant 635 nanometers is absolutely critical, because if the band width varies by as little as 5 percent, it can result in cellular destruction. The Erchonia laser varies by only “2 nanometers. Unlike many lasers on the market, the Erchonia laser precisely stimulates healing without overwhelming the cells or tissues’ ability to function properly. 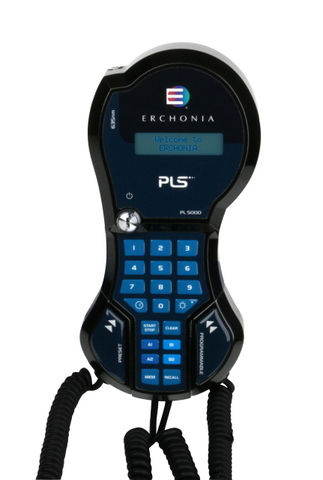 The Erchonia PL5 has four channels and generates two parallel lines of laser light. The four channels give you the ability to treat four different areas of the body at once and the line-generated beam is versatile enough to target small areas such as a nerve root or large areas such as an entire muscle or even the patient’s entire body. But the Erchonia laser also allows you to program in specific frequency oscillations that have been found to affect various tissues and organs. The oscillations that resonate with the targeted areas of the body are achieved by turning the light on and off at very specific and precise rates. The number of frequencies you can program is almost limitless and includes all of the known Rife frequencies. 1. Stanley Hoppenfeld, Orthopaedic Neurology: A Diagnostic Guide to Neurologic Levels (New York:Lippincott, Williams, and Wilkins, 1997); Kendall and McCreary, Muscles: Testing and Function, third edition (New York: Williams and Wilkins, 1983); David S. Walther, Applied Kinesiology: Synopsis (Pueblo, Colorado: Systems DC, 1988). 2. Jeffrey Maitland, Spinal Manipulation Made Simple: A Manual of Soft Tissue Techniques (Berkeley: North Atlantic Books, 1995). 3.Richard Martin, “Laser Accelerated Inflammation/Pain Reduction and Healing,” Practical Pain Management, (Vol. 3, Issue 6, Nov/Dec 2003), pp. 20-25. 4.Mae-Wan Ho, The Rainbow and the Worm: The Physics of Organisms, second edition (New Jersey: World Scientific Publishing Co., 1998). 5.For a fascinating discussion of the nature of midlines and their organizing function see especially the second volume of Franklin Sills’ two volume work, Craniosacral Biodynamics (Berkeley: North Atlantic Books, 2001 and 2004). For the sake of clarity I should point out that even though Mae-Wan Ho does not mention Sutherland’s discovery, she clearly articulates the organizing function of the midline. She says, for example, “some global orienting field is indeed responsible for polarizing liquid crystalline phase alignment, and hence, in determining the major body axis.” (The Rainbow and the Worm, p.166) An example of a structure whose center acts as an organizing axis or core is the well-known doughnut shaped torus. 6.James L. Oschman, Energy Medicine: The Scientific Basis (Edinburgh: Churchill Livingston, 2000) and Energy Medicine in Therapeutics and Human Performance (Philadelphia:Butterworth Heinmann, 2003). 7.See M. Merleau-Ponty, The Phenomenology of Perception, (Evanston: Northwestern University Press, 1964), and The Visible and The Invisible, (Evanston: Northwestern University Press, 1968). For a wonderfully rich and provocative discussion of Merleau-Ponty’s stunning contribution to the nature of human embodiment and the overcoming of mind/body dualism see M.C. Dillion’s Merleau-Ponty’s Ontology, second edition, (Evanston: Northwestern University Press, 1988). 8.For an elaboration of these points see for example my following two articles: “Radical Somatics and Philosophical Counseling,” Rolf Lines (Vol. XXVII, No. 2, Spring 1999), pp.29-40 and “Perception and the Cognitive Theory of Life: or How Did Matter Become Conscious of Itself,” Rolf Lines (Vol. XXVII, No. 4, Fall 1999) pp. 5-13. Also relevant is an article I co-authored with John Cottingham, “Integrating Manual and Movement Therapy With Philosophical Counseling For Treatment Of A Patient With Amyotropohic Lateral Sclerosis: A Case Study That Explores The Principles of Holistic Intervention,” Alternative Therapies In Health and Medicine (Vol 6, No. 2, March 2000), and my book, Spacious Body: Explorations in Somatic Ontology (Berkeley: North Atlantic Books,1995). 9.James L. Oschman, Energy Medicine: The Scientific Basis (Edinburgh: Churchill Livingston, 2000), p. 96. 10.Fröhlich’s investigations are discussed in some detail in Ho and both of Oschman’s books. 11.Mae-Wan Ho, The Rainbow and the Worm: The Physics of Organisms, second edition (New Jersey: World Scientific Publishing Co., 1998), p. 210. 12.James L. Oschman, Energy Medicine: The Scientific Basis (Edinburgh: ChurchillLivingston, 2000), p. 210. 13.See for example my following two articles: “Moving Toward Our EvolutionaryPotential,” Rolf Lines (Vol XXIV, No. 2, May 1996), pp. 5-23 and “Orthotropism and the Unbinding of MorphologicalPotential,” Rolf Lines (Vol. XXIX, No. 1, Winter 2001), pp. 15-23. 14.See for example, Zachery Comeaux, Robert Fulford, D.O., And The PhilosopherPhysician, (Seattle: Eastland Press, 2002).